In talking about how our Ducoterra radiant heating panels reduce heating costs we often get a lot of responses about how a “BTU is just a BTU” and that claims of increased efficiency are just “magic”. The fact of the matter is that, in the context of heating the same thing – air mass – those statements are perfectly true. The problem is that a lot of heating professionals tend to neglect to factor in radiant heat sources when designing heating systems. Since the vast majority of traditional heating systems heat air and then move it into the living space, that is where the bulk of their experience lies. So let’s talk about how we make living spaces comfortable, and not just how we can heat some air most efficiently. When you heat a space with a radiant heating panel located on the ceiling, you’re adding another component to the “human thermal comfort” equation. 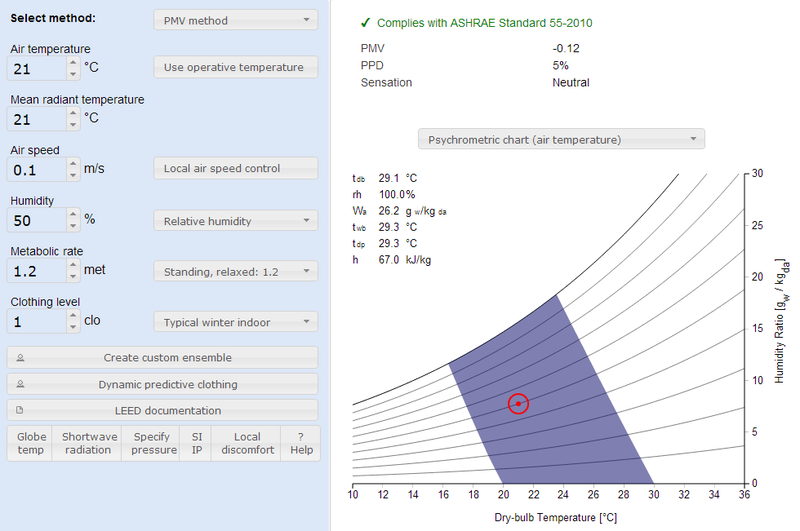 ASHRAE actually has a standard that takes radiant heating into account – ASHRAE standard 55. 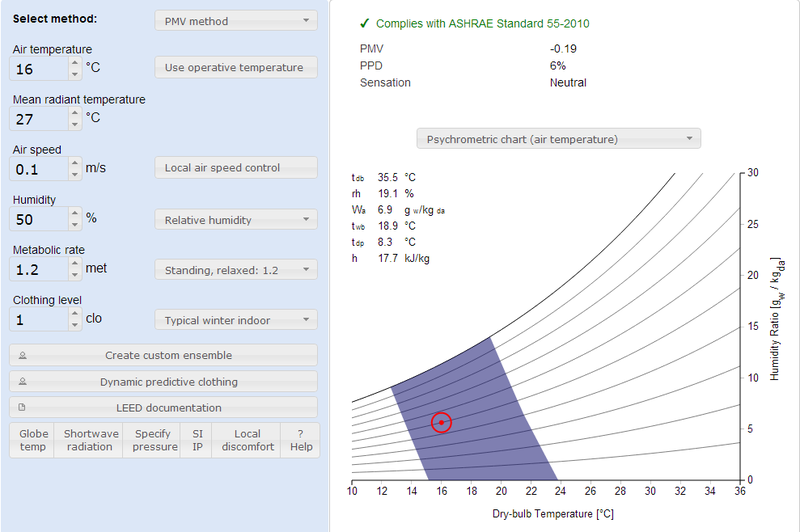 There are calculators freely available online that implement this standard as well, the CBE Thermal Comfort Tool being a great one. We’re going to have to get a bit technical here, so bear with me. If we use this calculator, we can find that typical indoor air temperatures of 21C (and assuming equilibrium with radiant objects in the room of 21C), produces good thermal comfort. But what about if we factor in a radiant heater on the ceiling? Our radiant panels typically have temperatures of around 90-100C, and occupy 1/10 of the space. Averaging this in we get a mean radiant temperature of 27C. If we plug this into the calculator, we find that good thermal comfort is readily achieved even with mean air temperatures of 16C. I’ve taken pictures of the CBE tool output for both these scenarios and you can see them below. This demonstrates, clearly, that we can heat a space comfortably at lower air temperatures by supplementing in infrared radiant heat. But how does this save us on heating costs? We have to pump heating energy into homes because we are always losing energy to the outside environment. That rate of heat loss is determined by the DIFFERENCE between indoor and outdoor air temperatures. So, by utilizing a lower air temperature, we reduce our heat loss to the exterior environment, resulting in heat savings. This heat savings is greater than the energy required to supply the radiant heating, thus resulting in a net energy savings. This is further improved through use of intelligent thermostats. Since radiant heat can be turned off and on rapidly in comparison with heating a large air mass, we can use aggressive programming that only heats the areas we need, when we need them. The proof is in the theory, and it’s borne out by our customers experiences as well. Customers who replace baseboard heating units with our system have reported substantial reductions in their monthly electric bills. We have other customers who are heating their whole homes using our radiant systems and enjoy low monthly electric bills. The efficiency of radiant heating systems is no myth and the technology has many applications where it can excel.